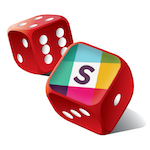 Use command /roll help to view this usage information from within Slack. Rolls a single 6-sided die. Rolls a single 20-sided die. Rolls a single 6-sided die with a +3 modifier. Rolls 10 6-sided dice and counts hits for results >= 5 and misses for those < 5. Results will also count how many hits are critical (the highest possible roll value) and how many misses are critical (the lowest possible roll value, 1).